Description: Sexes similar. 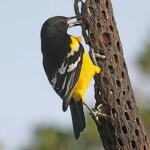 Black V-shaped breast band on yellow underparts; upperparts are dark brown with dusky edges. 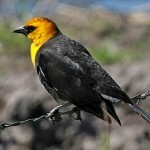 Brown striping on head; yellow throat; dark streaking on sides; and relatively long bill. Conspicuous white outer tail feathers are visible in flight. Entire cheek is gray, whereas Western Meadowlark has yellow lower half of cheek; but best distinguished by voice. Fall and juvenile plumage is duller overall and black breast band is much paler. 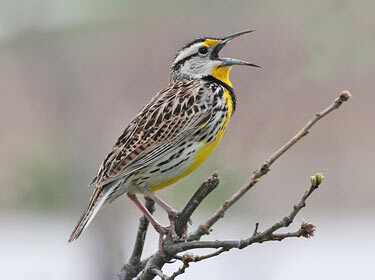 Behavior: Meadowlarks fly with stiff wings, usually fluttering them a few times and then sailing. Habitat: Tallgrass prairies, meadows, small grain fields, weedy areas, and similar open, grass-dominated habitats. Where in Nebraska: Found in low, moist areas around marshes in the Sandhills and along the western Platte River. Common spring and fall migrant and summer resident in eastern Nebraska, becoming rarer westwardly. Hybridizes with Western Meadowlarks in west. Occasionally overwinters. 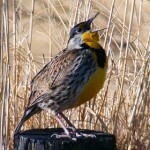 Fun Facts: If an Eastern Meadowlark feels threatened by a predator, it crouches down to hide its bright yellow breast.